Marge sends Lisa to a performing arts camp, where counselors and fellow campers inspire her to embrace her creative side; upon returning to Springfield, Lisa grows restless with her boring suburban lifestyle. Lisa invests in Nelson's brand-new business venture, but soon realizes that her friend's instant success might lure him away from the classroom. Worried that his judgment might be clouded, Lisa introduces Nelson to the well-educated and successful creator of Facebook, Mark Zuckerberg, only to find out that he too dropped out of school. 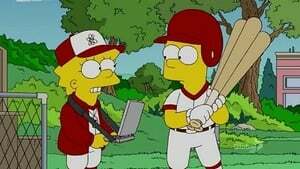 Lisa starts coaching Bart's Little League team; Marge and Bart spend the day at an amusement park, where former MLB manager Mike Scioscia gives Bart advice. 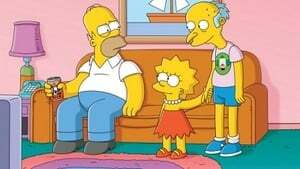 "Treehouse of Horror XXI" is the fourth episode of The Simpsons' twenty-second season. It first aired on the Fox network in the United States on November 7, 2010. 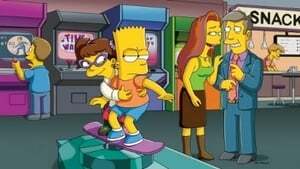 This is the 21st Treehouse of Horror episode, and, like the other "Treehouse of Horror" episodes, consisted of three self-contained segments: In "War and Pieces", Bart and Milhouse discover a real-life board game that they must win to return home; in "Master and Cadaver", Marge and Homer go on a honeymoon on a sailboat, and rescue a mysterious castaway named Roger; and in "Tweenlight", Lisa falls in love with a vampire named Edmund. "Treehouse of Horror XXI" was written by Joel H. Cohen and directed by Bob Anderson. Daniel Radcliffe and Hugh Laurie both guest starred in the episode. The first segment references Jumanji, the second is a loose parody of Dead Calm and the third satirizes the Twilight novel and film series. The episode also contains references to The Office, A Clockwork Orange and Sesame Street. In its original airing on the Fox Network during the November sweeps period, the episode had a 3.7 Nielsen rating viewed in approximately 8.2 million homes. Critical opinion of the episode was mixed, with "Tweenlight" generally being regarded as the best of the three segments. Discovering that Marge was once a stellar A+ student whose grades plummeted after being distracted, Lisa fears that she will end up just like her mom unless she pledges to focus solely on academics in an encore episode. When Marge makes a secret deal allowing Lisa to attend her dream school, Lisa learns a lesson in family and altruism. 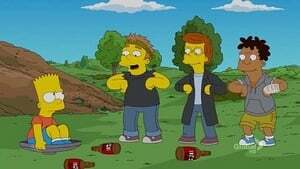 Meanwhile, Bart puts Nelson Muntz in his place and unintentionally claims the title of "School Bully"
After learning that he is suffering from multiple illnesses and has only a few weeks to live, Mr. Burns becomes distraught by the town’s less-than-sensitive reaction to his announcement. 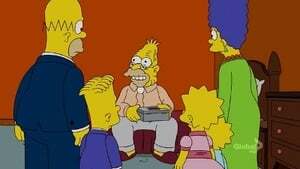 Following an unexpected turn of events, Bart finds Mr. Burns weak and vulnerable in the wilderness and secretly takes him into the Simpsons’ home. 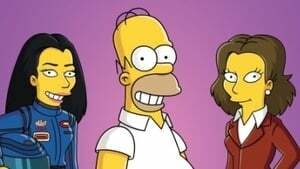 But when Homer and Marge learn about their new houseguest, they decide it’s payback time, and Lisa, determined to stand up for Mr. Burns, learns that old habits die hard. Episode 7 - How Munched is that Birdie in the Window? Bart helps nurse an injured pigeon back to health. After Santa's Little Helper eats the bird, Bart has a hard time coping with the loss. Worried that Bart needs some help getting over the loss, Marge and Homer take him to a therapy session with Dr. Thurston, who advises that the only cure for Bart’s blues is to give away the family dog, but when the Simpsons visit the pup’s new home, a shock causes them to rethink their decision. When the rest of the family seems to lack Christmas spirit, Marge contacts Martha Clause (Martha Stewart). Jon Hamm will guest star as a Federal Bureau of Investigation agent as Homer goes undercover to infiltrate Fat Tony's mob. 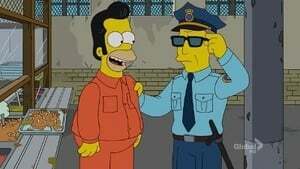 Joe Mantegna will return as Fat Tony, and also voice his cousin Fit Tony. Marge reconnects with a close group of mothers she used to be friends with; Bart tries to break up their group when his playdates stop being fun. 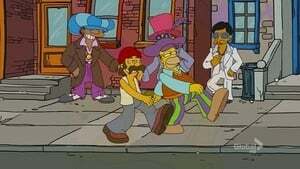 When Smithers transforms Moe's pub into a refined and trendy lounge, the establishment becomes Springfield's local gay hangout; Principal Skinner falls for the new, free-spirited music teacher (Kristen Wiig). When Homer insists Bart must earn the new dirt bike he wants, Bart comes up with a scheme; James Lipton interviews a TV cast. Moe gets Homer to be his wingman, but becomes distraught when the women are drawn to Homer as well. 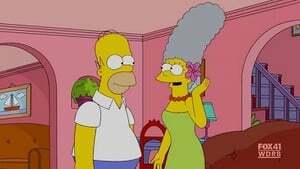 Meanwhile, Marge discovers some gray hairs and tries a new more mature hair style to go along with it, much to Bart's dismay. 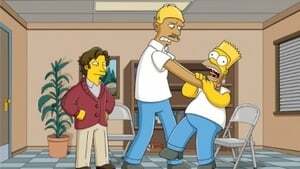 Bart and Homer make a film based on Bart's comic book character Angry Dad. 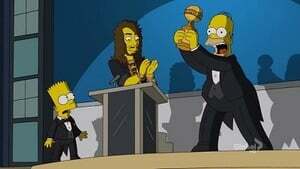 The cartoon becomes a critical favorite and begins to win a number of awards, but Bart becomes upset when Homer takes all of the credit during acceptance speeches. 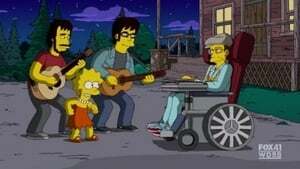 "The Scorpion's Tale" is the fifteenth episode of The Simpsons' twenty-second season. It aired on the Fox network in the United States on March 6, 2011. 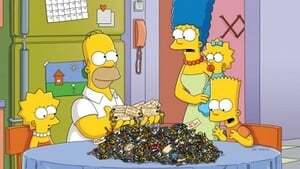 "Love is a Many Strangled Thing" is the seventeenth episode of The Simpsons' twenty-second season. It aired on the Fox network in the United States on March 27, 2011. 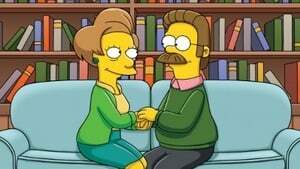 Fat Tony (voice of Joe Mantegna) woos Marge's sister Selma, and they marry. 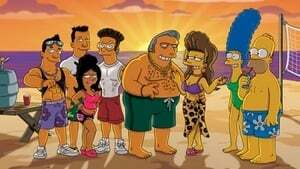 Marge worries that Selma is choosing her new lifestyle over family after the whirlwind romance, but Tony invites Homer and Marge to join them on a getaway at the Jersey shore. Meanwhile, Bart develops a gift for finding truffles, much to Lisa's delight. After Homer discovers a genius talent for styling hair and opens his own salon, he becomes Springfield’s most in-demand hair stylist. But having to listen to women’s problems and gossip all day long leads Homer to believe his gift may actually be a curse. 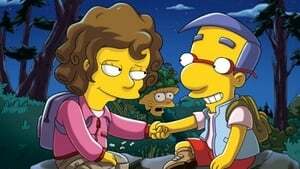 Meanwhile, when Milhouse decides to live each day to the fullest, he comes out of his shell and professes his love for Lisa, only to have his heart broken. Milhouse then catches the eye of popular fifth-grader Taffy, causing Lisa to make a bold move. 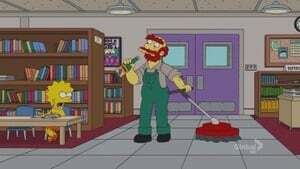 When the Simpsons discover a collection of keys to every door in Springfield, Lisa stumbles upon an eerie hidden classroom beneath Springfield Elementary School. When she shares her discovery with Principal Skinner, the secret room mysteriously disappears and he takes the only key away. A determined Lisa uses her detective skills to lead her back to the room to solve an old school mystery. 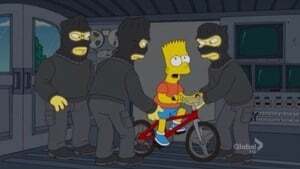 Feeling guilty for getting Mrs. Krabappel suspended after one of his school pranks, Bart helps her escape detention, and Ned Flanders winds up saving her life in the process. 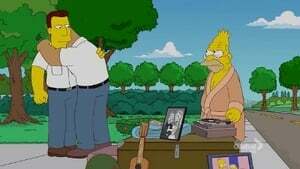 When Edna and Ned start dating, he is surprised to learn she's been with many of Springfield's men, including Homer and Aerosmith drummer Joey Kramer.